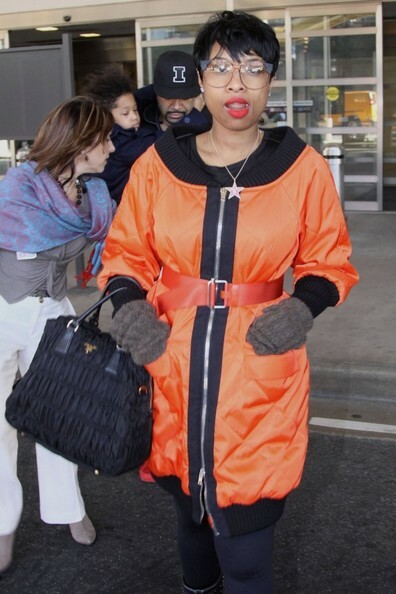 This is not Jennifer Hudson’s best look – by a long shot.. Not only does the singer’s threads make her look way older than her 32-years, they also make her look like one big orange-issue jail smock wearing criminal! Jennifer Hudson arrived at Reagan National Airport in Washington, D.C. earlier today ahead of her scheduled performance for Michelle Obama’s 50th birthday celebration. She was accompanied by her fiancé David, their adorable little David Jr., and her assistant Walter. If Hudson is singing royalty then she must be wearing the emperor’s clothes.